I recently had the lucky opportunity to get a (vintage) projection screen for my microscope for free! 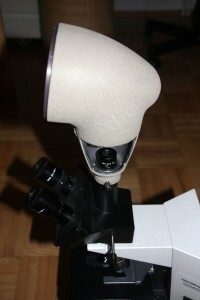 The screen is mounted on top of the trinocular head, instead of a camera. It is then possible for several people to view the microscopic image, which is projected on the screen using the regular lighting system of the microscope. The screen, essentially, functions like a low-tech monitor. The front surface of the screen is made of frosted glass, inside the “tube” there is a mirror which reflects the light from the trinocular head to the screen. A projection eyepiece is also needed. These screens are now mostly obsolete, with camera systems connected to a monitor offering more flexibility and a brighter image. Naturally, the image quality is much lower than when viewing the image directly through the eyepiece. The dark areas of the image are not really completely dark, which is due to internal reflections of the system. This naturally reduces image contrast. The frosted glass also reduces the resolution and brightness of the image somewhat. I was using a projection eyepiece which was intended for cameras. Other projection eyepieces may produce a brighter image. The projection screen is almost parfocal with the eyepieces. This means that both images (from eyepeice and screen) are nearly equally sharp when focused. The main advantage of the screen is, that several people can watch the specimen. The disadvantages are, nevertheless, manyfold. The light intensity is quite low and it therefore necessary to darken the room. Alternatively, one needs a very bright illumination system, which may heat up the specimen. The field of view is also small. These issues can be resolved by using a different projection ocular. The screen is made of metal and has a window on one side, below the mirror. I do not know if the cover of the window is missing, or if it is intended that it is open. I think that the purpose of the window is to allow easy access to the projection ocular. A screen like this is certainly a cheap and simple solution for allowing several people to watch the same specimen, as is commonly required in education. I do have another use in mind, though: It is possible to use the screen for drawing microscopic images. By simply taping a piece of paper on the frosted glass surface, it should be possible to trace the image. I will experiment with this and let you know on how successful this undertaking is.